Just Back From The Library (292/365 v2.0) – Annoyingly Boring? Don’t know where I saw it, either on a blog I follow or on somebody’s Facebook feed, but I know or at least “know” somebody who recently read this and loved it. I just can’t remember who it was. Got the email the other day that it was finally available and ready to be picked up at my library. UPDATE: It was Rob Weiher from (Un)qualified to Blog, another 365’er who mentioned the book. I’ve seen it somewhere, too… looking forward to hearing what you think. .-= christine´s last blog ..Stop & Go =-. lol. 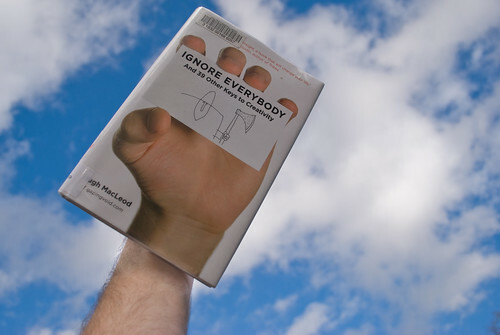 well the book is specific in why and when you would want to ignore everybody i would think. but that being said, my memory was a bit fuzzy, rob didn’t actually recommend the book. so there mr. smarty pants! .-= Jérôme Aoustin´s last blog ..Project 365 – Day 106 =-. Great photo – You should do one of those album cover ones that i’ve seen other people do. Been thinking about getting back on the project 365 wagon myself, but ant to work out how to incorporate it into my blog. .-= Dan´s last blog ..A request for a signature =-. Awesome I can’t wait to read the review! Jerome – yup, duct tape came in handy (also handy that it was a library book so it had the clear plastic cover on it so i could use scotch tape to keep the book from opening. Jimmy – nice to see you! I think Hugh’s a genius. I follow him on Twitter now, but I’ve actually followed his work for years. A fact he seems to be completely oblivious of. I guess he’s really got this ignoring thing mastered, or something. .-= Piper of Love´s last blog ..Master of Disguise: The Connoisseur =-.